This 3-bedroom house located just off Soi Khao Noi is the perfect family home, with superb indoor and outdoor space, including a private garden and private swimming pool. The house has 3 bedrooms and 2 bathrooms, and is on the market with an asking price of 5,800,000thb. 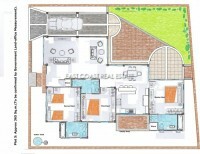 It is situated on 81wah of land, and is being sold fully furnished to a good standard. The house has full air-conditioning, hot-water, paid cable television and internet services already installed. The fitted kitchen is of European standard, with a 4-ring gas hob and hooded extractor fan. The living room is furnished with a flat-screen television and brand-new couches and looks directly out onto the pool, which can be accessed via patio doors. The house is exceptionally clean, secure and well-maintained. This house is being sold in Thai name, with tax and transfer fees split 50/50 between the buyer and the seller.